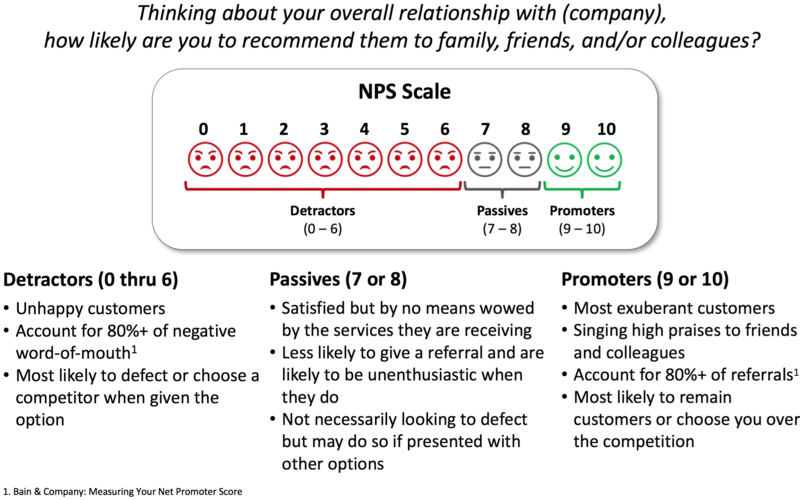 An important metric in any successful VoC program is NPS, or Net Promoter Score. You should know a lot about NPS before you begin VoC. This is why this lesson is so early in the book. NPS is well known across industries, in companies of all sizes, and throughout executive boardrooms. In fact, NPS is regularly reported in some quarterly results, and it has become the de facto standard for how well companies are doing with their customers. The concept of NPS was created by Fred Reichheld, the author of The Ultimate Question: Driving Good Profits and True Growth. NPS has become so popular, and so widely used, that it truly has become the ultimate question in the VoC world. It’s important to keep in mind that NPS is a straightforward question that measures your overall relationship with your customer based on the bundle of experiences they have had with you over time. Zero means that the customer is very unlikely to recommend the company, whereas a 10 means that their recommendation is very likely. Customers who answer with a number from 0 to 6—called detractors—are subtracted from the promoters, or those who answer with a 9 or 10. For example, if eight out of ten customers answered with a 9 or 10, then 80% of your customers are promoters. If 5% answered with a 0 to 6, they are unlikely to recommend your company, and that 5% would be subtracted from your promoter total of 80. Your NPS is 75. Customers who answer with a 7 or 8 are categorized as passives. Passives don’t figure into the NPS calculation but are important to consider as well. NPS allows you to draw insights by comparing promoters, passives, and detractors. Are promoters more likely to buy your new product or expand their relationship with you? What do you need to do to move a customer from being a detractor to a promoter? NPS allows you to dig into these questions and many more. NPS is also easy to understand, with the score represented as a single number falling anywhere between –100 and +100. Because that simple score grabs the attention of executives, NPS will build VoC credibility and focus within the organization. And because it’s a common metric across industries, it also provides you with the opportunity to benchmark your NPS compared to other companies in your industry or other industries. NPS is not a flawless metric. It can provide excellent insight into the overall relationship you have with your customers, but it falls short in measuring how well the most recent experience went. Used as the only metric in transactional VoC surveys, valuable customer experience feedback may fall through the cracks. NPS also presents limitations during telephone surveys—especially when the telephone survey uses an interactive voice response, or IVR. Perhaps the biggest flaw in NPS is that it’s a lagging metric. It asks the customer about their cumulative, overall opinion of the company. This feeling builds throughout the customer’s past experiences but does not always indicate the customer’s future actions and intentions. Rather than going to war against NPS (which plenty of people like to do; do a web search on it sometime), simply keep its limitations in mind. Want to know your NPS Score?